During the holidays, a Christmas tree is a focal symbol of hospitality in the home. Pope John Paul describes the Christmas tree tradition as a symbol that exalts the value of life. However, the evergreen’s historical purpose goes beyond hospitality. In its history, ancient peoples hung evergreen wreaths on their doors to protect their homes from illness, evil spirits and misfortune. The first ever “Christmas tree” was recorded in 1576 in Germany. However, this tradition did not make its way to the United States until the mid-nineteenth century with the customs and influence of German immigrants—many of whom settled and founded their Moravian churches right here in Winston Salem! 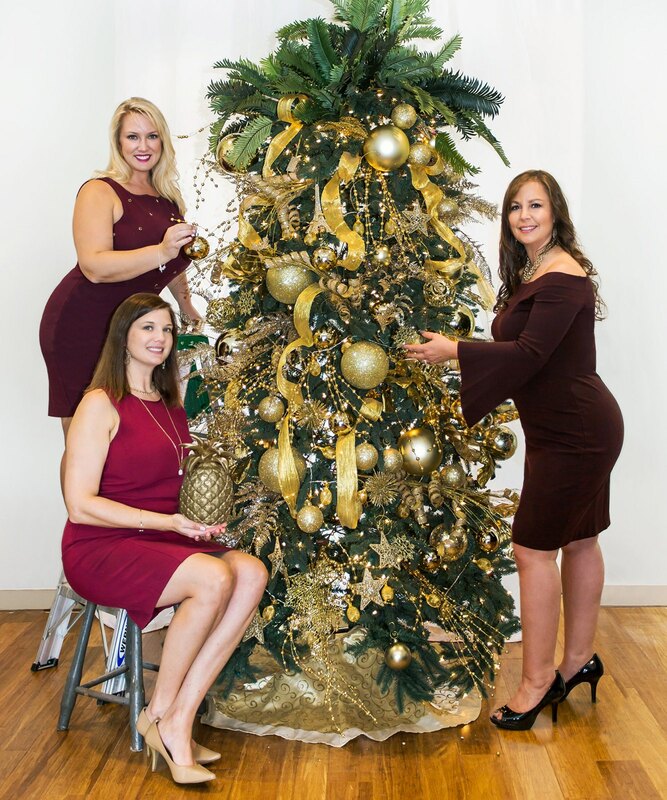 The ladies at Southern Signature Properties are donating a themed Christmas tree to the Cancer Center at Wake Forest Baptist Health. An evergreen’s symbolic protective energy against illness and its traditionally warm hospitality make the tree a perfect addition to the cancer center. The tree will be pineapple themed in reference to the company’s logo— cleverly chosen because it is a symbol of hospitality. In addition to the Cancer Center at Wake Forest Baptist Health, Southern Signature Properties has also donated to a variety of other organizations, including Ruff Love Rescue, a non-pro t organization that rescues and finds homes for animals, and Second Harvest Food Bank. The women have also donated many hours of labor to the housing program through Habitat for Humanity—a nonpro t that provides the opportunity for qualifying working-class families to become homeowners. Jenny loves Habitat for Humanity because “there’s nothing I love more than to help people become homeowners.” Also, this fall the women brought school supplies, teaching supplies and new book bags to the teachers and counselors at Parkland High School. These full-time realtors admit the ability to give back to the community is what truly gives them Joy! The flamboyantly decorated pineapple-tree will be displayed in the Cancer Center at Wake Forest Baptist Health this holiday season. If you’re looking for a personalized approach to buying or selling, look no further than Southern Signature Properties at Realty One. They are located at 3720 Vest Mill Road in Winston-Salem. Call 336.749.5388 to schedule an appointment today. Follow on Facebook and Instagram @livesouthernnc or visit livesouthernnc. com to learn more! Sources: “Christmas Tree.” Encyclopedia Britannica. 2012 Erhsam, Roger (1999). Le Vieux Turckheim. Ville de Turckheim: Jerome Do Bentzinger. ISBN 290623883X. Alfred Lewis Shoemaker (1999) . Christmas in Pennsylvania: a folk-cultural study. Stackpole books. (52-53). “Christmas Tree is a symbol of Christ, says Pope–and a sign of ‘Undying Life.’” Zenit News Agency. Dec. 19, 2004. Retrieved: Sep. 15, 2018.